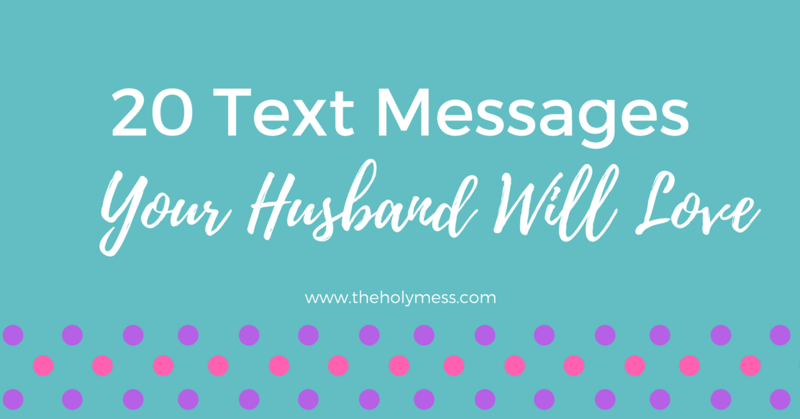 Today I am excited to host guest writer Carolyn White from Thee Farm Wife. Carolyn is an organizing whiz. 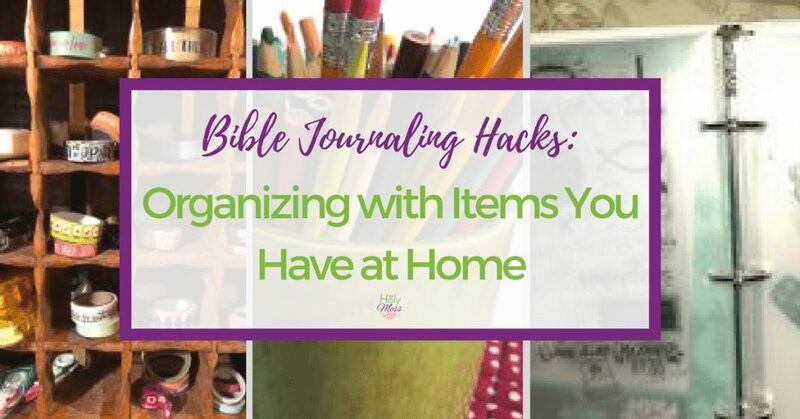 Follow her Bible journaling hacks to organize your supplies using items from around your home. I sometimes get caught up in buying all of the things before I even begin doing all of the things for a project. 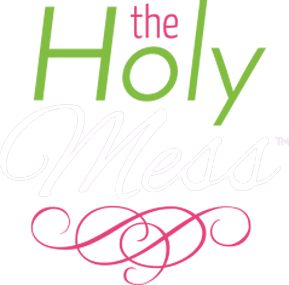 The truth is we often spend too much money and waste too much time trying to accumulate the supplies before we even begin. We get caught up in buying the things rather than the actual project itself. 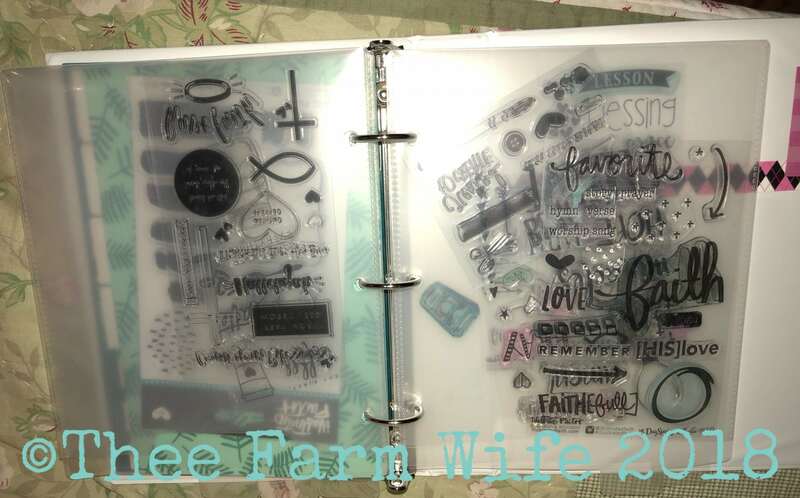 Case in point: Bible journaling. But really, isn’t it more time with God we really desire and crave? If not, it should be. So, as per said confession, I do have most of the popular journaling supplies. And those supplies need to be organized. I am a thrifter by nature. It’s in my blood. 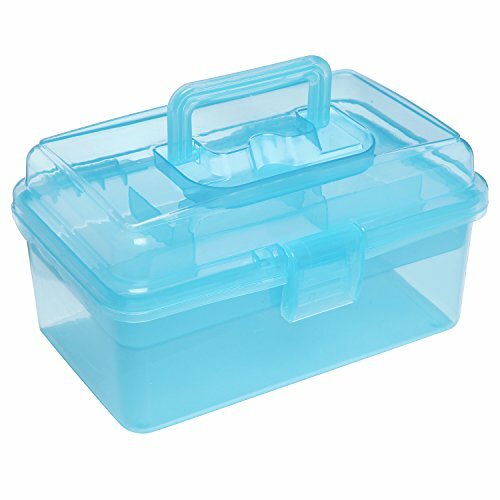 I check my favorite thrift store first for most of my purchases: from clothing to kitchenware. I spend less on things that I know can be found at thrift stores so that I can enjoy – ahem have more money for – other stuff. 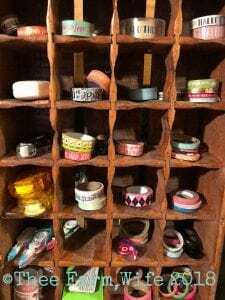 I have found pencil sharpeners, art supplies, stamps, tassels, stickers, crayons, markers and really nice pens, storage containers, binders and even a journaling Bible at our local thrift store. Look at this beautiful pot! I store mine in this beautiful hand thrown pot that I purchased for a dollar at the thrift store. Every time I see it I am in awe of it’s beautiful colors. 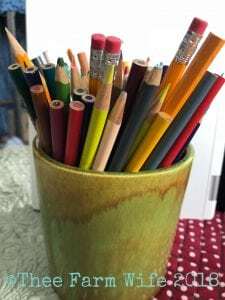 You can find bags of colored pencils, crayons and markers at thrift stores, too. Love using my handmade caddy! My dad brought over a tool caddy that my Grandpa had made. 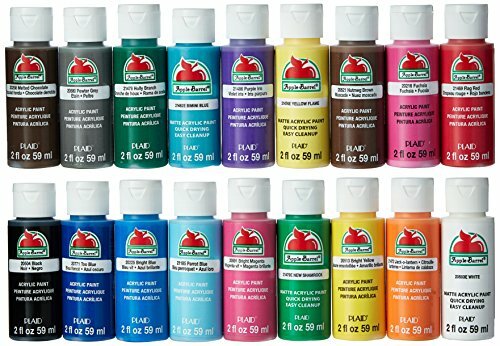 Now, I could have put it on display on a shelf and forgotten all about it, or use it every time I paint. Using it and loving it wins every time. 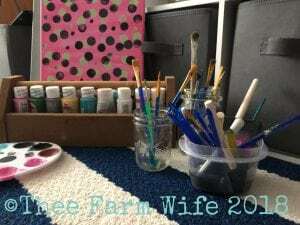 Paint brushes can be stored in Mason jars. I even use jars for my water for mixing, then pop them in the dishwasher so they are clean and ready to go for next time. 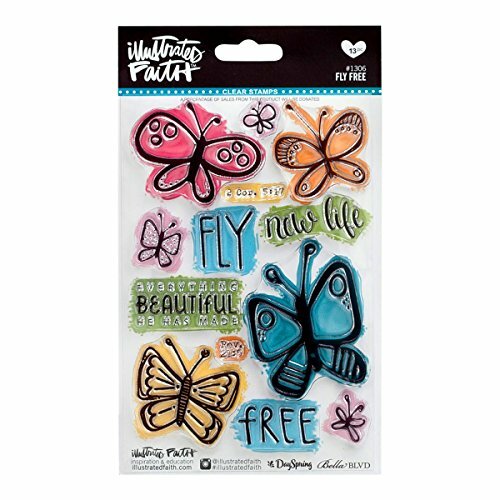 I store my clear rubber stamps in a small binder – they fit perfectly in pocket pages. 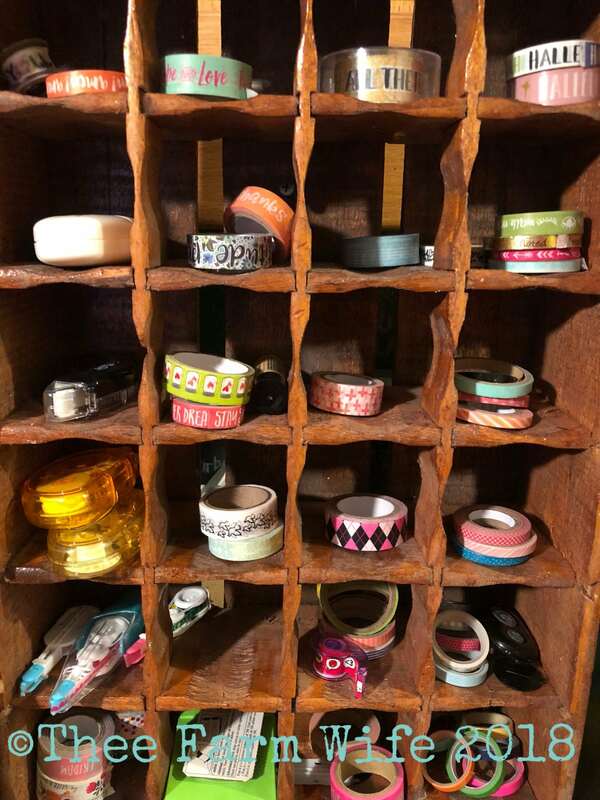 Store washi tape where you can see the variety and pick just the right color and design. Remember the most important organizing lesson of all – don’t get carried away with the things – get carried away with the worship. 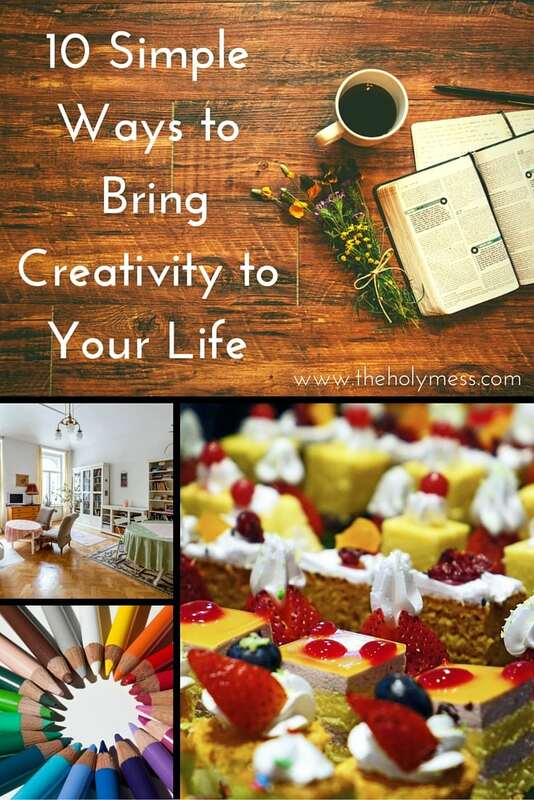 Bible journaling is the art of creating with your Creator. 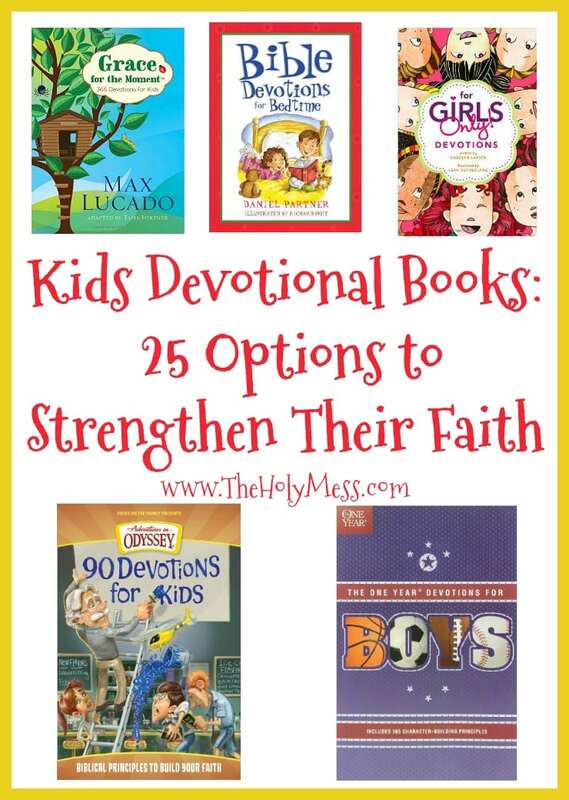 God doesn’t care if you use $50 markers or a 50 cent pencil. Maybe the one thing we should allow ourselves to invest in is time. 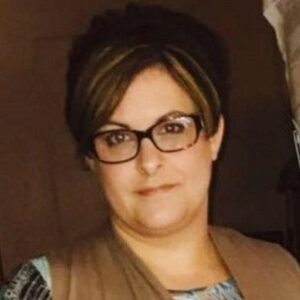 Carolyn White is Thee Farm Wife and radio morning show host at KWAYradio.com. She has been married to Thee Farmer, John, for 15 years. Together they are raising five children in ages from 4 to 25. (One flew the coop and is married.) 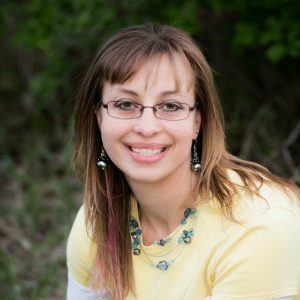 Raising cows, kids and corn, she enjoys reading, Bible journaling, living a simple life Thee Farm Way and motivational speaking. 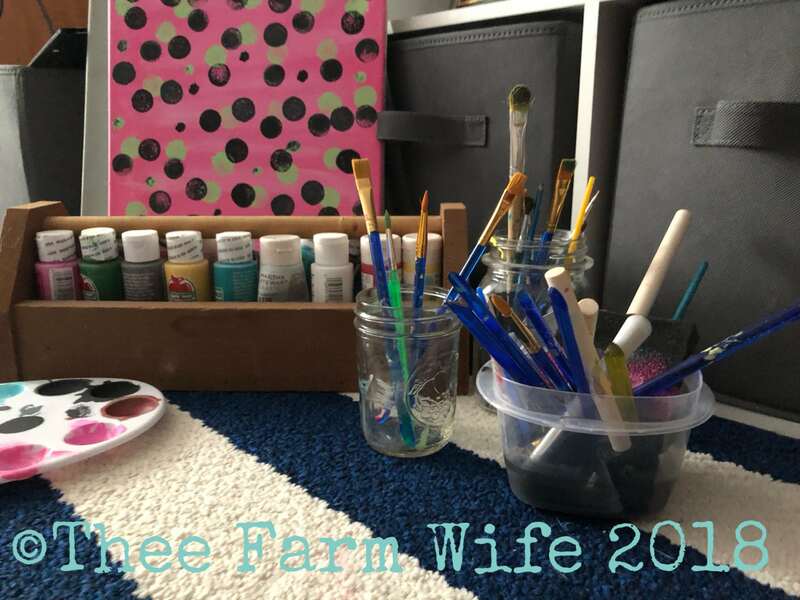 Follow her journey at www.facebook.com/theefarmwife. *Receive a free printable Bible Journaling Supply List for Beginners. Success! Now check your email to confirm your subscription and then you will be able to download your supply list. What clever ideas. I’m off to dig up a stamp binder.